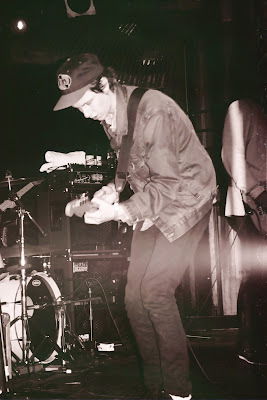 It's a funny thing about Jamie T – on record he's got this sort of obnoxious vibe that would suggest closeted, long-term obsessions with grime and emo at once, and if his Los Angeles show on Wednesday was any indication, his audience doesn't do much to dispute this image. Bleach-blondes thrashed about to his more upbeat moments as though he fronted a genuine rock band; equally polished girls on the stage's opposite end flirted their way to a free beer from his guitarist. In truth, I felt rather frustrated at the Brit's recent album Panic Prevention because it felt like a novelty altogether, with an accent that finds cutesy appeal in grime culture but music that (with the exception of minimalist tracks on acoustic bass guitar) would have a lot of corporate pop radio appeal, if only it were shoved in that direction and heavily edited for profanity. And because his freshly gathered fan base was built on this rather bland album, it was more the fans than the artist that made the show feel a bit like a frat party. To make things more unfair for the artist, it wasn't initially obvious whether the show would be empty save for members of the press, as there were no more than fifty people present for opener Nu-tra* and professional cameras held by about twenty percent of the small audience. As it turned out, though, Jamie T's set felt less like a photo-op than that of Nu-tra, whose front man milked every opportunity to pose for a shot. 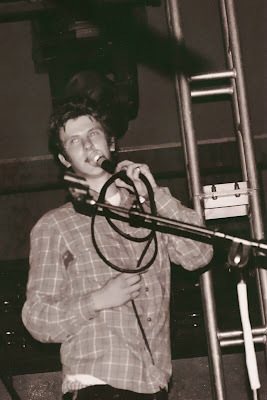 Jamie T actually performed as though he'd already grown bored with his recorded material, removing the synthetic aspect of his songs and only incorporating live instruments – provided by four-piece backing band the Pacemakers – so that he could play rock star. True, most rock stars aren't scrawny British boys who don plaid shirts, playing alongside band members who resemble Iggy Pop or sport acid-washed denim. 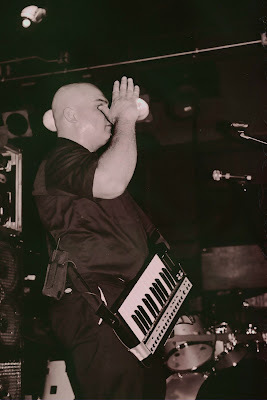 But whereas Panic Prevention finds him focused on his rhymes and bland pop beats, his live show found Jamie working the crowd, weaving within and above it, leaving few still photo-ops and appearing to live out a recent punk fantasy. And he pulled it off quite well, though a full-band rendition of “Brand New Bass Guitar” sort of missed the point of the album original, a rough solo jaunt on an acoustic bass guitar. 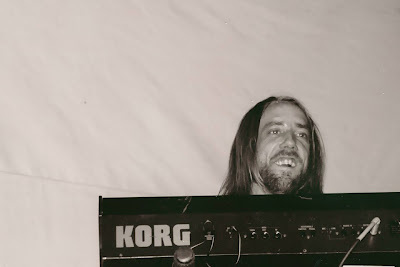 “Salvador” saw drums turned up and bass toned down, a complete reversal of its recorded counterpart, and lyrical downer “Sheila” garnered the biggest level of audience enthusiasm. What was actually quite cool about the overall performance was that it ended on a stronger note than it began, the encore starting with a solo acoustic bass rendition of “A New England” and ending with the band passing homemade mix tapes to the majority of the audience, now deemed “friends” of the group. In all, I'm not sure Jamie T has a lot of long term potential, or whether even he is sure how to present himself as an artist, the style differences between album and performance considered. But he's quite decent at bringing intimacy to a venue, and his humility makes him likeable while his energy and drive make him a simple good time for the crowd lovingly known as "the kids." *If you're wondering about Nu-tra, a preachy bunch in matching uniforms with a Devo-meets-Aquabats aesthetic, check out their My Space page here. What's not apparent from their page is that their front man's striving to be the next Jello Biafra. 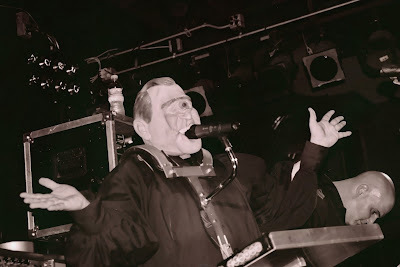 Check out a live show for his performance as Mr. Uno, a character in black robe and one-eyed Dubya mask who bellows like a monkey and forces the audience to acknowledge under oath that they're sheep. This coming from a band with a My Space page. Nice post but you put Operation twice. Ah! I'll change that, thanks for checking. Yousendit does some crappy things on occasion. NU-TRA sounded nothing like the aquabats. I spoke to the singer after the show and I asked him what his influences are and he had mentioned Devo and Fear buzzcocks. He also told me they were asked to be on the bill 3 days before the $15 dollar show hence the small turnout. I thought they put on a great show which a lot of bands don't do in this town. I googled a search for "Jamie T. at the troubadour" and came across this page. I thought he was fun as well and I had been looking forward to see him for weeks. But I've learned being in the entertainment bussiness that there are two types of people.. Those who create and those who destroy. That's all completely fair, and yes, my statements were quite rude, but I stick with my opinions of the show. The Aquabats reference had nothing to do with ska and everything to do with their image; as far as the short notice goes, it's great of them to have taken up the slot, and they seem like nice people who put on a fun/entertaining show, but I don't see them having much appeal for more than a novelty quality. And yes, maybe those are frank opinions that destroy, as you say, but I get a bit tired of bands forming when they're focusing more on that novelty appeal than the music they could be making. It's great that people experiment and have fun with music, but there are so many bands in this city, and very few of them stand out for good reason. Still, to each his own. In any case, thanks for the thoughts. Hey there, Anonymous. You might be right about needing to find rare tracks, and if there's anything more worthwhile, I'd love to know about it. The tracks I posted are the only ones I didn't immediately want to skip over on the album, though - the commercial dance beats of the other tracks drove me a bit batty after not too long. Any song recommendations? p.s i would agree however that he looks bored of his material, i know for a fact this is material he has had written since he was at school and i think he has played the same tracks on tour for the past year almost, he is very talented in terms of just making great music and i would imagine playing the same songs night in night out will driveh im crazy, anything to make money tho i guess. Thanks for the input, I'll give those songs a few more listens now that some months have passed. You're right that he was probably bored as a result of playing the same songs repeatedly - I know a lot of bands do get that way and mix it up a bit with the songs to give themselves variety. And as for where he's from, it's true that I don't know much about the specifics of English culture, but I find it odd that he's got a grime-ready voice over such commercial music. Individually, I could see each working, I just don't know that they work well together. But I'm only one person.